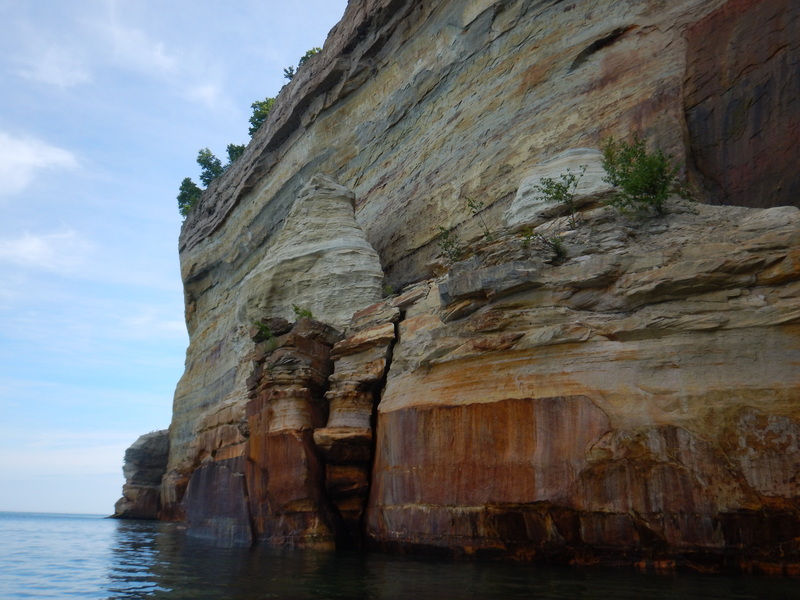 After seeing a 15 mile stretch of the coast on the boat cruise, we planned a few hours worth of kayaking in order to get up close to the stained sandstone cliffs and eroding caves. 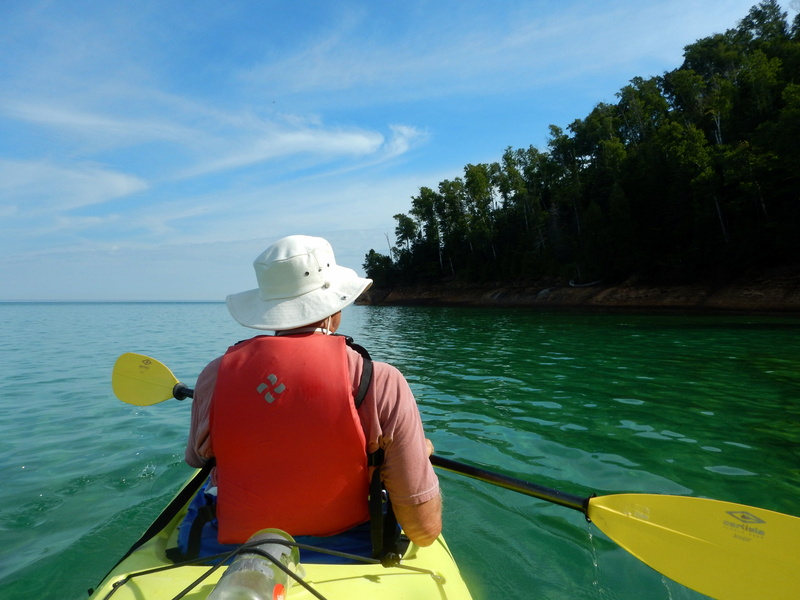 This was our third time paddling in a tandem kayak (the first and second times were in and around the Apostle Islands National Lakeshore in Wisconsin) and Tom’s third time kayaking ever – and we finally nailed it. 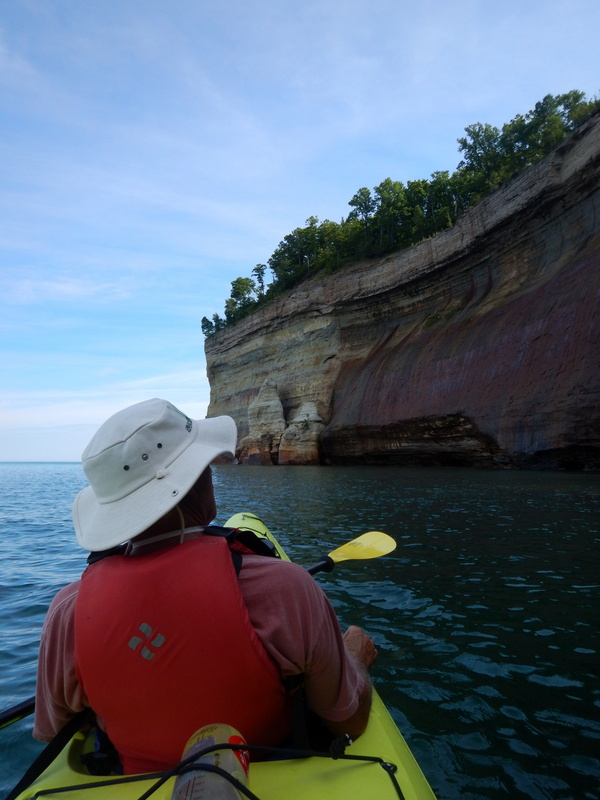 I had kayaked prior to this trip, though not recently, and was accustomed to steering entirely through stroking, particularly when maneuvering into small spaces when I’d alternate short strokes and dragging the blade. This is not, I repeat, NOT the best way to steer a longer, heavier tandem. It’s also completely counterproductive when the person in back is steering the opposite way using the rudder. 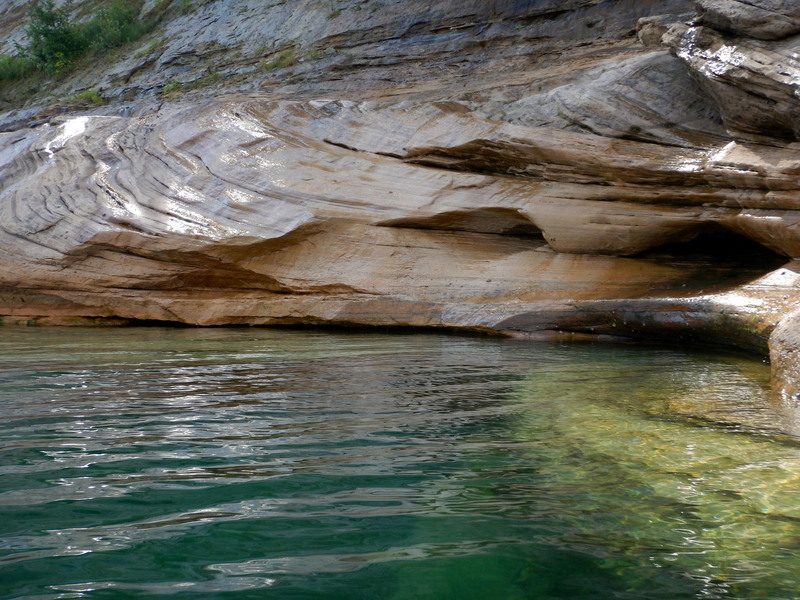 Anyway, all my kayaking experience had been in singles without rudders and so I spent the entire first time unconsciously attempting to steer us through caves, under arches, and facing the direction I wanted to take a photo while Tom was trying to maneuver us in somewhat different directions by using the foot pedals that controlled the rudder blade. In short, I was unaware that he was trying to use the rudder, and he was unaware that my combination of strokes were an attempt to move us in any particular direction. By the second time we figured out that verbal communication would be an aid in navigating (though I’m going to admit that said verbal communication is not my strong suit) and we attempted to work together in piloting the boat, but Tom was fighting with a sticky rudder that in combination with the wind made it pretty challenging to steer. But, the third time’s the charm! 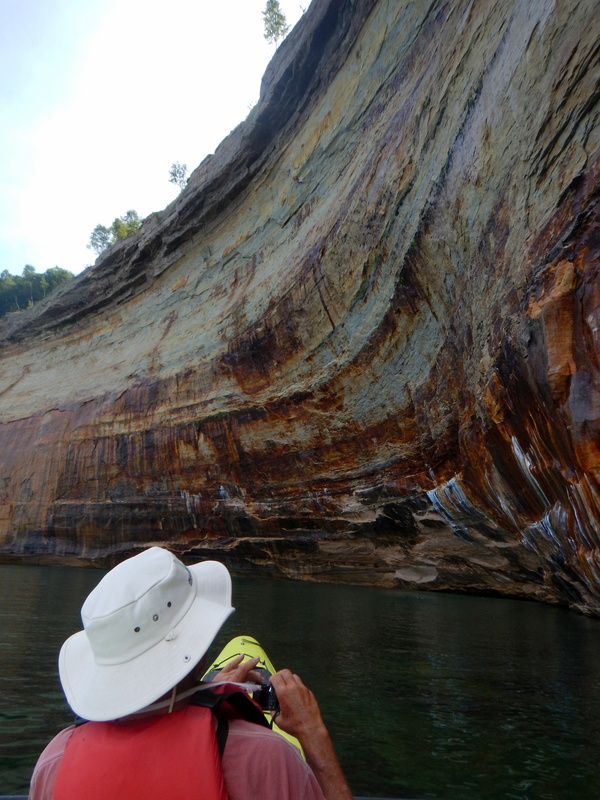 We kept up a steady stream of chatter regarding which cave or formation we wanted to get close to, and at what angle we each wanted to take a photo from, which resulted in a much more enjoyable paddle. We also decided that I’d sit in back in order to steer using a combination of rudder and drag strokes despite Tom graciously offering me the front seat again for the sake of photo-taking. You could read this as a success story that results from indulging my control issues when it comes to photography angles but I like to look at this as a positive development in our kayaking history. Halfway joking. 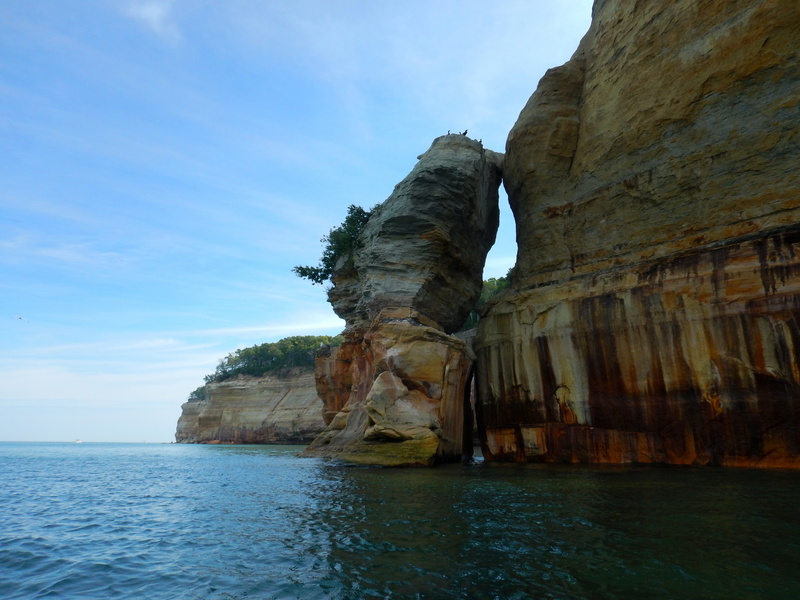 Ok, but seriously, we had a very pleasant kayaking experience at Pictured Rocks, one that made being able to view the details in the colors and formations of the rock even more spectacular. 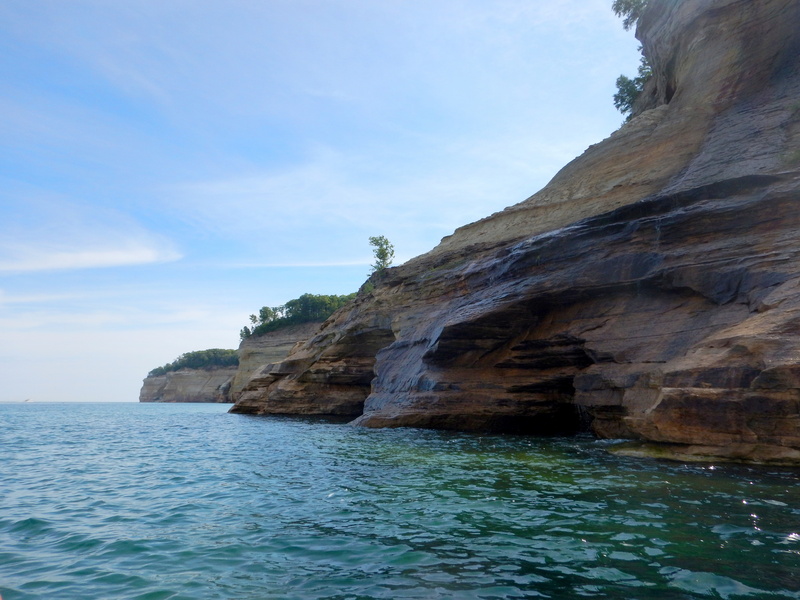 Launching from Miner’s Beach, we paddled across the bay and followed the cliffs until they towered nearly 200 feet above us. 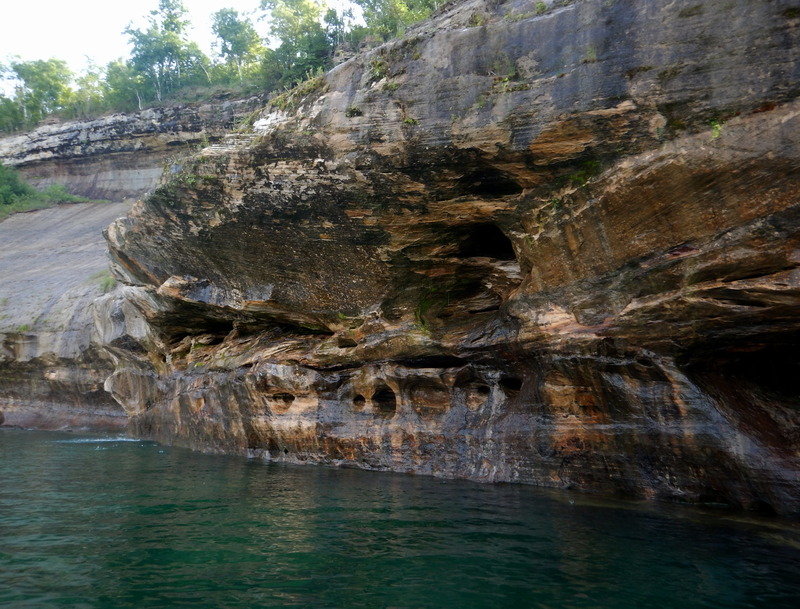 En route we explored shallow caves, viewed picture-perfect underwater ledges, and navigated around channels of water dribbling over the bluffs. 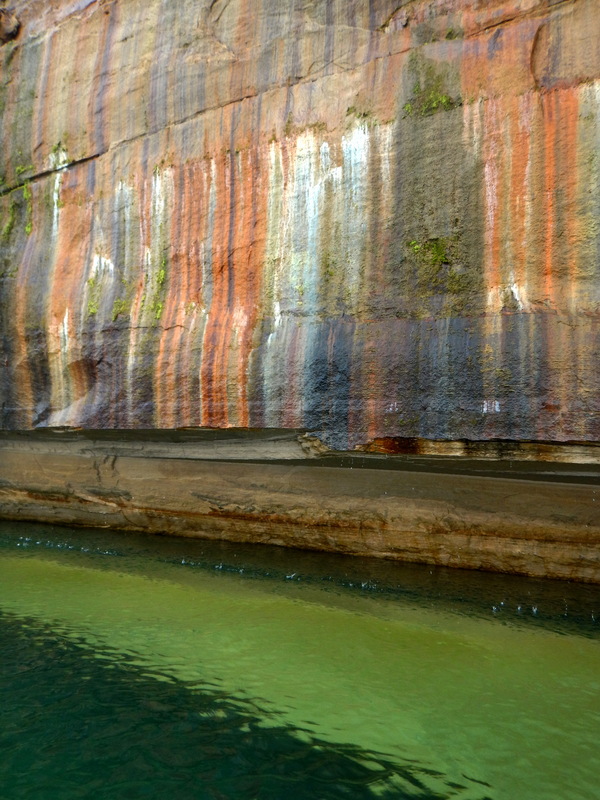 We passed Bridal Veil Falls, which looked way more imposing from water level, then entered a cove in which the dark manganese- and iron-stained rose dramatically above our heads. 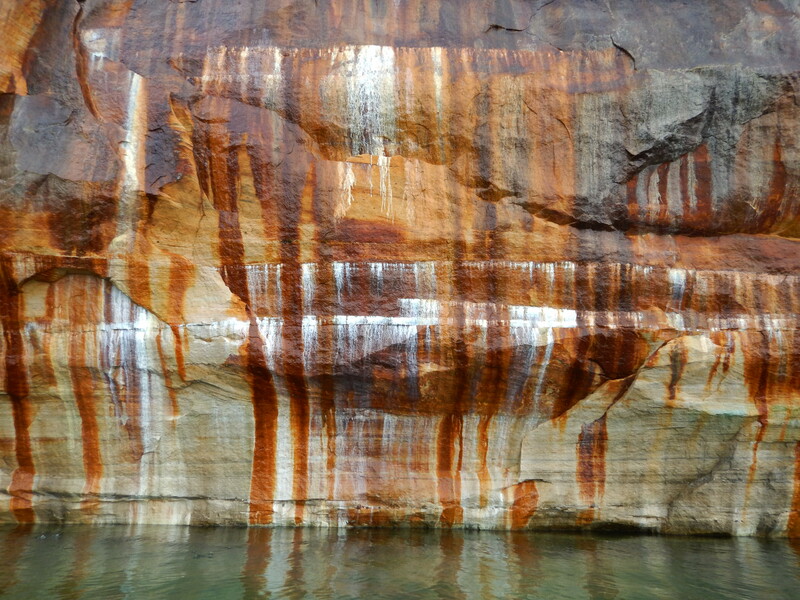 Here we had some of the best detailed views of the mineral streaked sandstone as well as pieces of fractured cliff faces that were soon to crash into the lake. 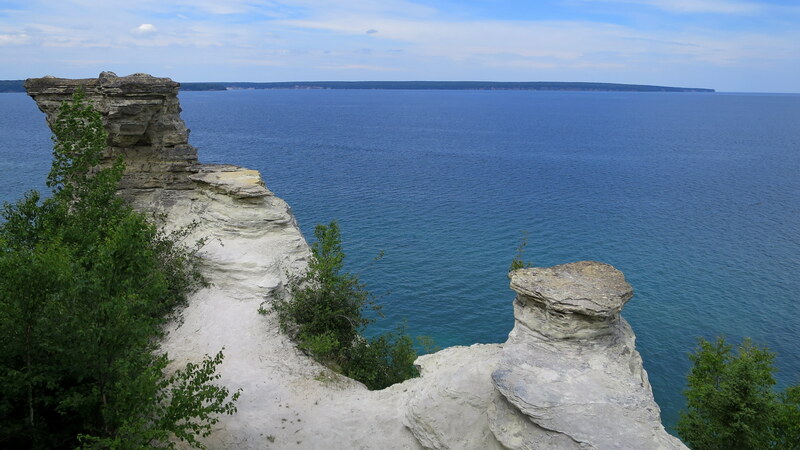 After returning to the beach we walked the short trails on top of the Miner’s Castle formation, which had superlative vistas of the vivid water colors in the inlet on the west side. 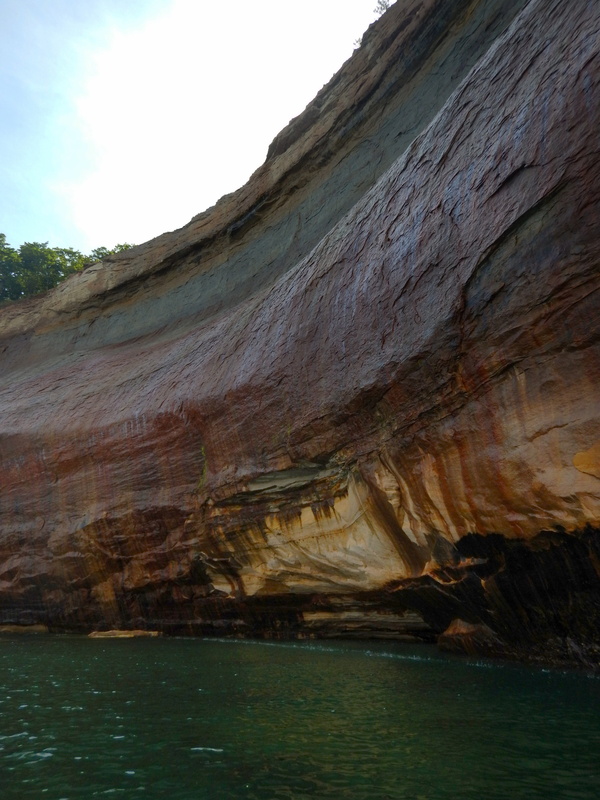 Somewhat unfortunately this turned out to be the last activity of our visit to Pictured Rocks: We had planned a long hike along the coast the next day but in our attempts to both hike and see some of the overlooks farther down the coast the next day we were assaulted by blackflies. 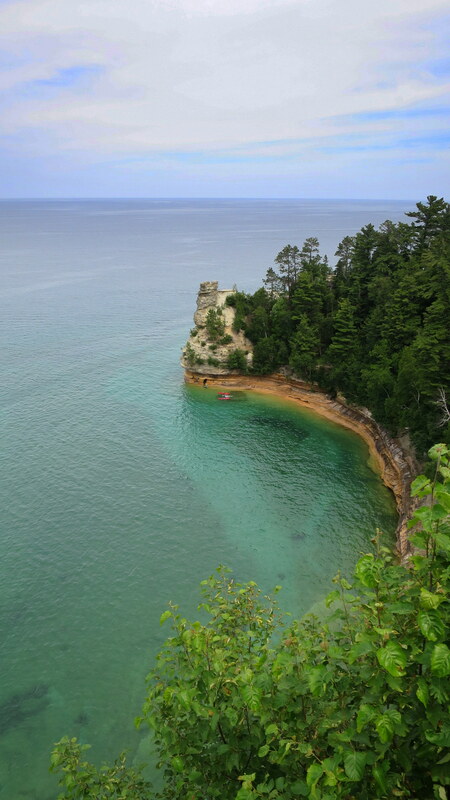 We had already traveled to the far eastern edge of the lakeshore on our quest to find a hike so we continued on to the town of Grand Marais where we found a beach that was out of their range – and then celebrated our escape with a beer at the Lake Superior Brewing Company. A Pale Ale and a Blueberry Ale later, our missed hike was all but forgotten. Fantastic shots! 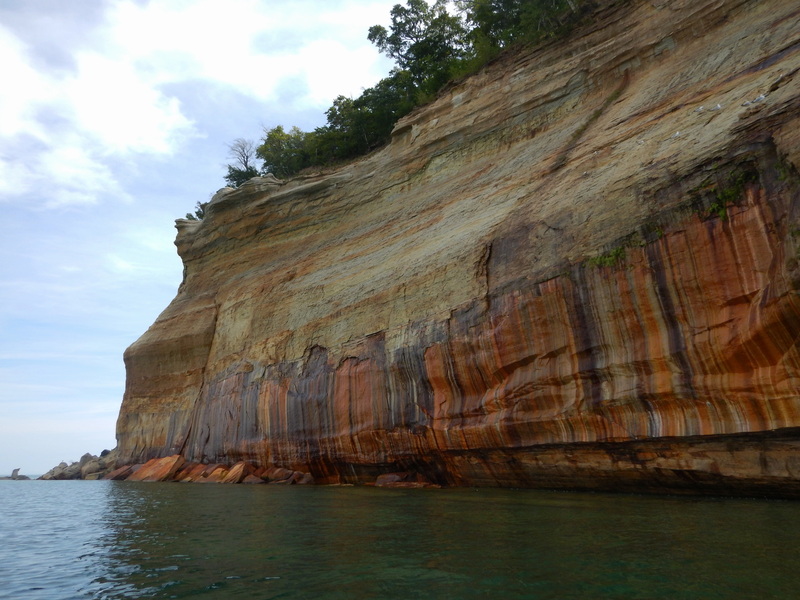 I remember visiting Pictured Rocks and how fascinated we were with their stripy, streaky patterns. Yes! The patterns and streaks are so wonderful. Thank you! 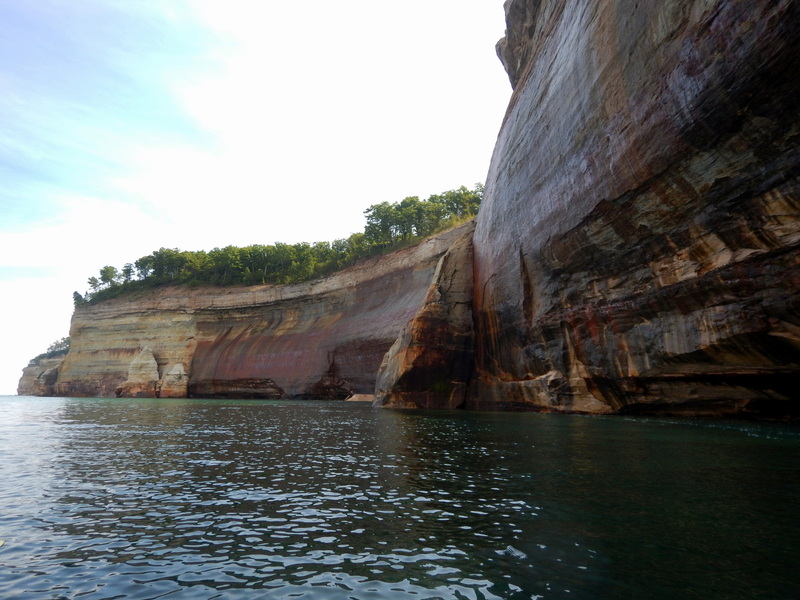 Kayaking was definitely ideal for exploring the Lake Superior coast, Liz, and going in the tandem was pretty fun. 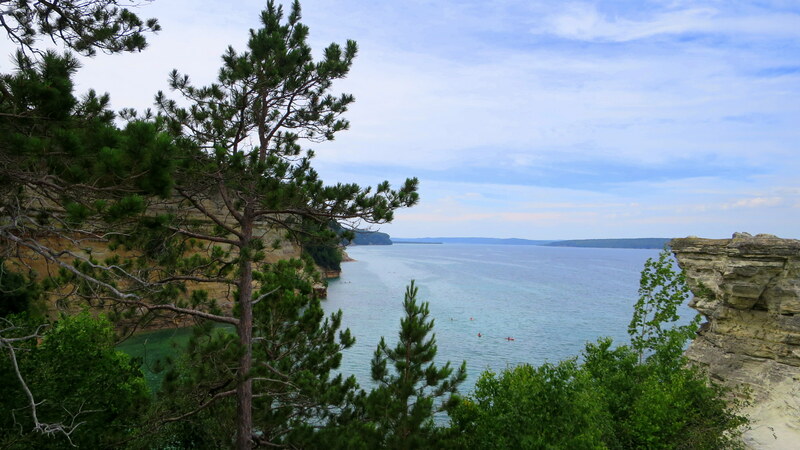 Neither of us could believe that this is what the Michigan coast looked like or that the US side of the lake in general was so gorgeous. Awesome! If you haven’t gone in the winter, you should definitely do some snowshoeing! 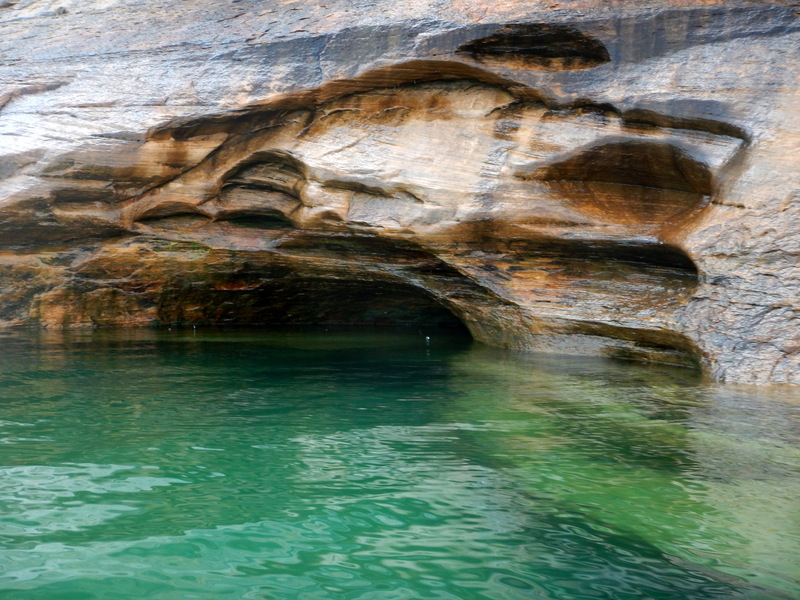 Munising falls and the Grand Island Ice Caves are amazing and unreal. Thank you for the tips, Michigan Mac. 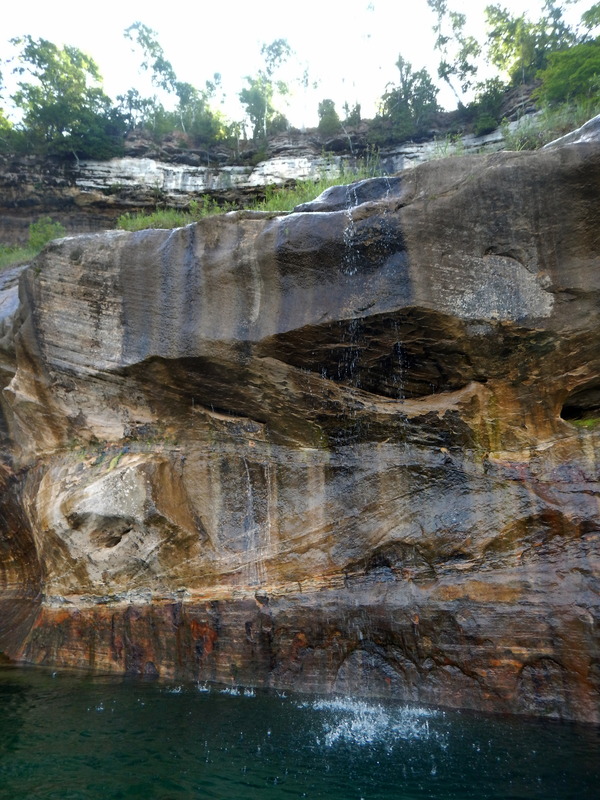 I’d love to see the lake and the falls in winter but I’m wary of that cold! Almost take our coats off! 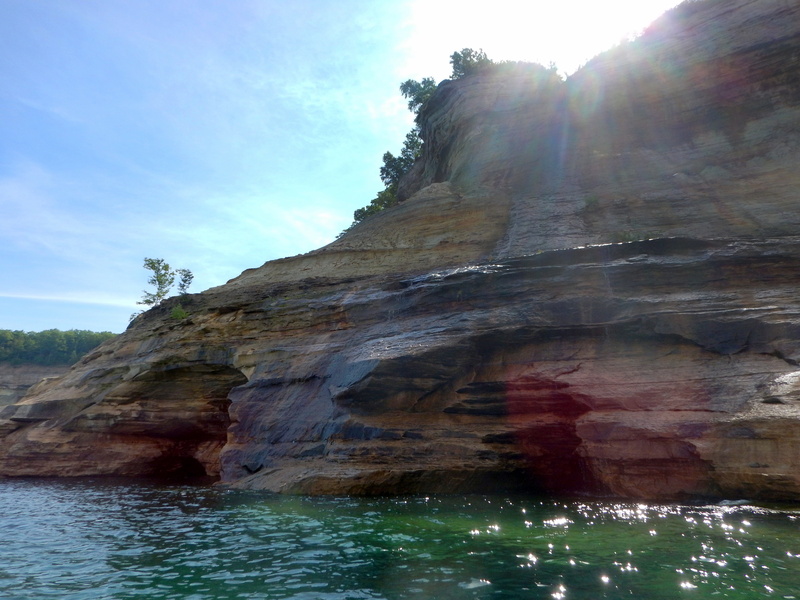 Such a gorgeous place, ErinJoelle!